Something weird was destined to happen. How could it not? 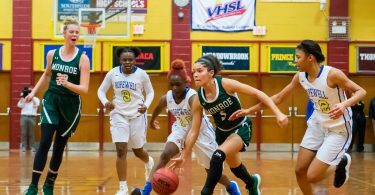 The Miller girls saw its semifinal on Friday with Atlantic Shores postponed to set up a double header on Saturday for the Mavericks to defend their back-to-back-to-back-to-back state title run and make it a five-peat. Miller got the job done Saturday afternoon with a 36-28 win in the semifinals to set up a championship game at the end of the night with top-seeded Highland. So when the Mavericks held the Hawks to just four first half points, an impressive effort, but yet another oddity, the table was set for something else peculiar to happen. And it did. Highland fought back in the third quarter to make it a one-possesion game early in the fourth. “Winning five in a row is tough and we showed it tonight,” said Miller coach James Braxton. 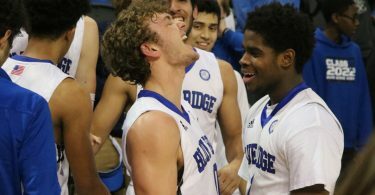 The relief was visible late in the fourth quarter as Highland tried to foul its way back into the contest with Miller and the Mavericks knocked down one free throw after another. 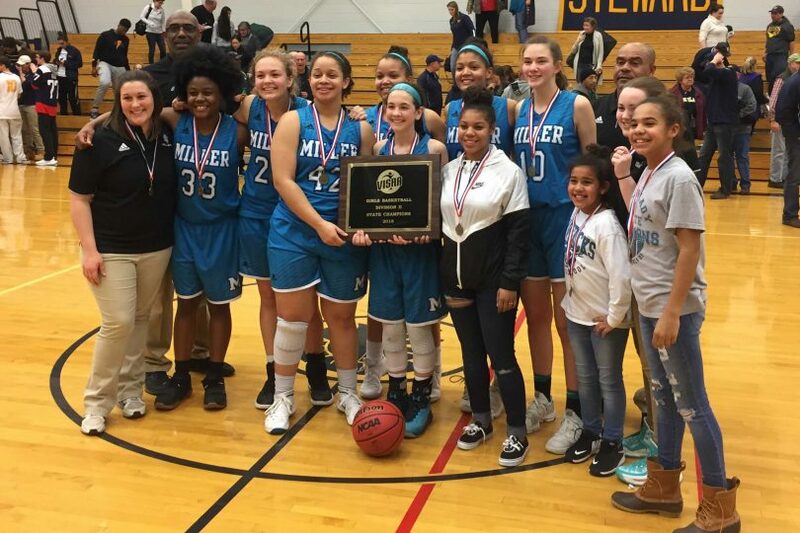 With the dust settled, Miller was able to enjoy the last minute of play with a 43-35 win to make it five straight VISAA Division 2 champions and seven state titles in the last nine years. Miller raced out to a 17-0 start, holding Highland to zero points in the first quarter and just four in the second. The Mavericks got a trio of 3-pointers from freshman Olivia Wagner in the first half and some help in the paint of Naya Hunter to take a an 18-4 lead into the break. Kayla Soltys scored all four of the Hawks points in the first half and in the second, she went on a tear knocking down a trio of shots from beyond the arc, scoring 11 in the third quarter and getting Highland back into the game with the lead down to 27-25 to start the fourth. While that was the closest that Highland would get, the fourth was tense. Wagner hit her fourth three to make it 30-25 with 6:17 to play. From there it was all about free throws for Miller and Hunter hit plenty of them. The Mavericks went 11-for-12 from the line with Kianna Johnson making it a 37-33 game with just under a minute to go. Hunter hit all four of her foul shots in the next thirty seconds to turn it into a 41-35 lead. Then Wagner hit two more and the Hawks called off the defense after two misses on their offensive end and allowed the Mavericks to run out the clock. Highland’s Soltys led all scorers with 19 points. The Hawks came in with a 23-3 record and took down last year’s state runner up, Seton, in the semifinal to set up the meeting with Miller. Wagner led the Mavericks with 15 points. Hunter was close behind with 14 points and eight of them coming in the fourth quarter. Chloe Sable and Hannah Woodard each chipped in four. The win for Miller seemed improbable just over a month ago when its leading scorers and only senior, Jalyn King was knocked out for the year with a knee injury. “Jaylin really wanted a fourth one so we had to get it for her,” Wagner said. With only King graduating this year, the Mavericks return their entire playoff roster next season, instantly setting up expectations for this remarkable run to continue.